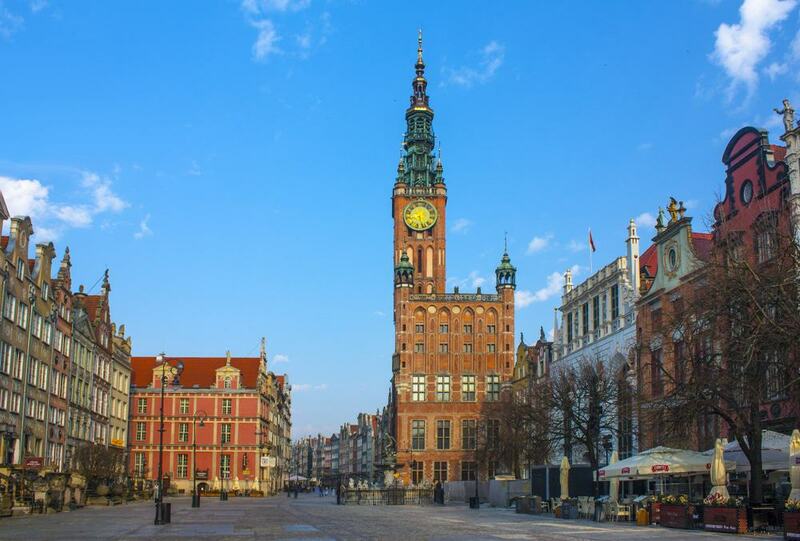 Poland’s largest port flourished during Medieval times as a merchant city trading Baltic amber. 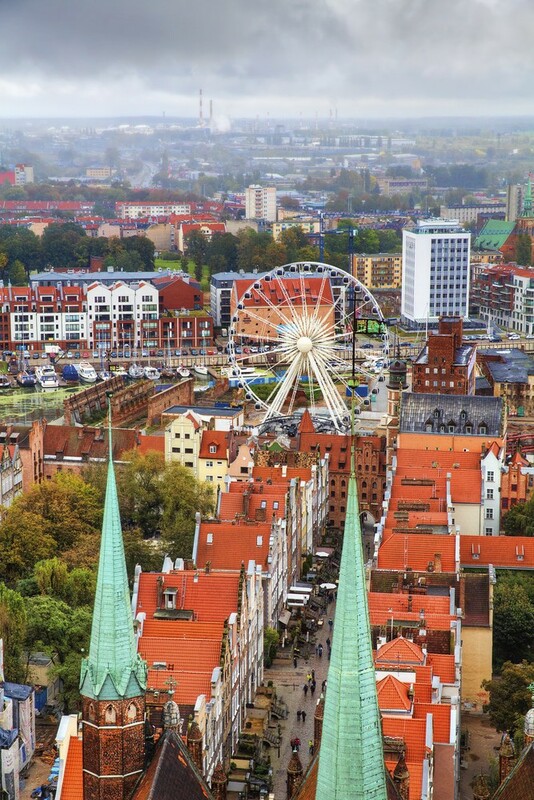 In the 20th century events took place in Gdańsk that would affect the course of world history. On 1 September 1939 the Wehrmacht launched their Invasion of Poland at the Westerplatte peninsula north of the city. And just over four decades later in 1980 Lech Wałęsa would found Solidarity. As the Soviet Bloc’s first independent trade union, Solidarity would eventually lead to an end to communist rule in 1989. Both the war and Solidarity are remembered with world-class museums. 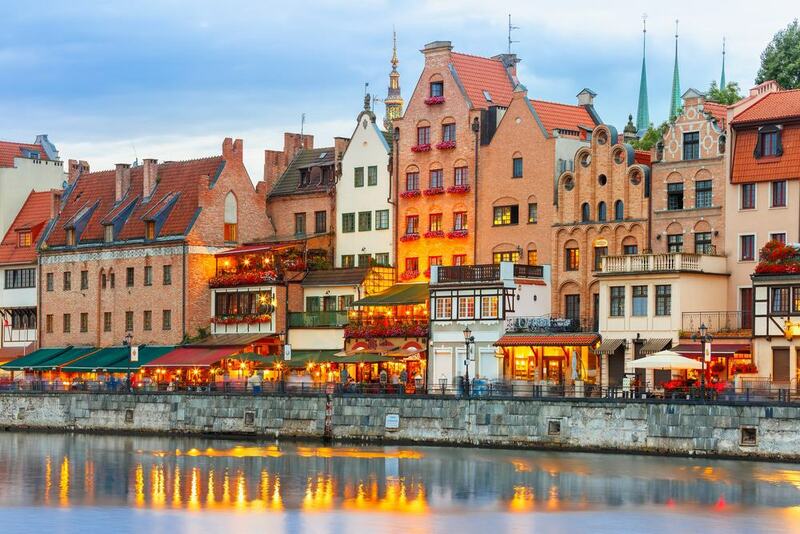 Gdańsk’s Old Town, rebuilt after the Second World War, is a trelliswork of streets skirted by tall patrician and merchant tenements, while hulking gates defend the landward and water-side entrances. 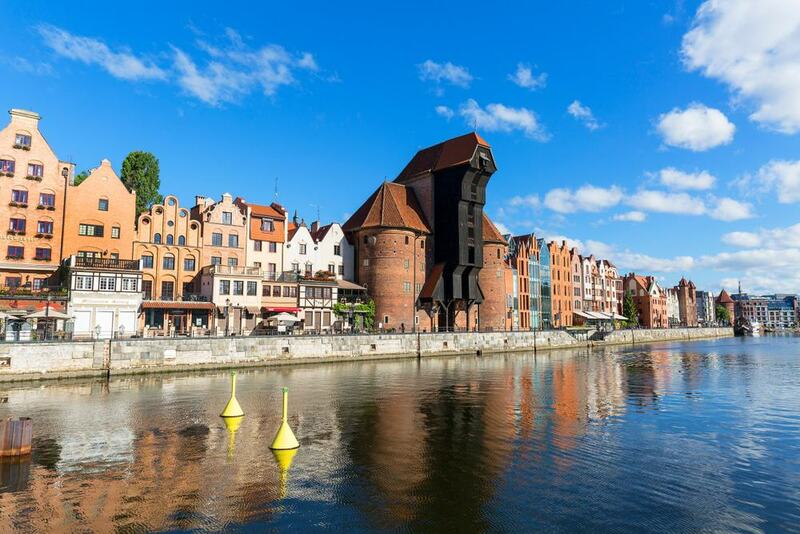 To cut to Gdańsk’s core and see a host of top monuments in one walk, take this horizontal route east towards Motlawa River between two city gates. Along Ulica Długa (Long Street) and then Długi Targ (Long Market), the Royal Way first got its royal designation in 1457 when King of Poland Casimir IV Jagiellon entered Gdańsk. Starting in the west at the Upper Gate and finishing at the Green Gate, the way is flanked by tall, narrow patrician tenements painted in jaunty colours and capped with gables. There are way more attractions and noteworthy sights on Trakt Królewski than we could cram into one paragraph. But at Długi Targ 44 do stop for a photo of the Artus Court, a Renaissance meeting place and stock exchange, now a branch of Gdańsk’s Historical Museum. 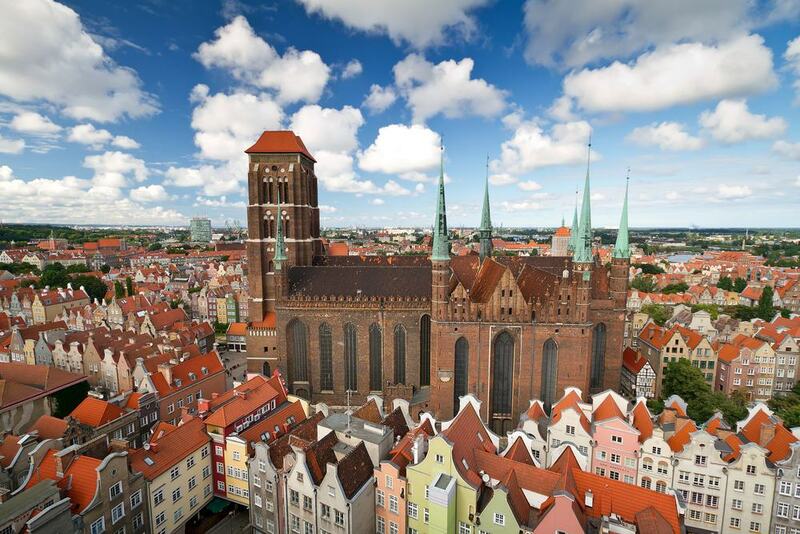 This humungous Gothic church was started in the 14th century and, with a volume of up to 190,000 cubic metres, is counted among the three largest brick-built churches in the world. Standing in the 66-metre-long nave you’ll need to take a moment just to wrap your head around the dimensions of this epic building that can hold 25,000 worshippers. A major reconstruction was needed after the Second World War, but all of its valuable fittings were saved. You can peruse treasures like an astronomical clock from the 1460s, the high altar raised in the 1510s and a marvellous Gothic stone pietà carved at the start of the 15th century. If you’re up for climbing nearly 400 steps you can battle your way to the top of the monolithic 77.6-metre main tower. 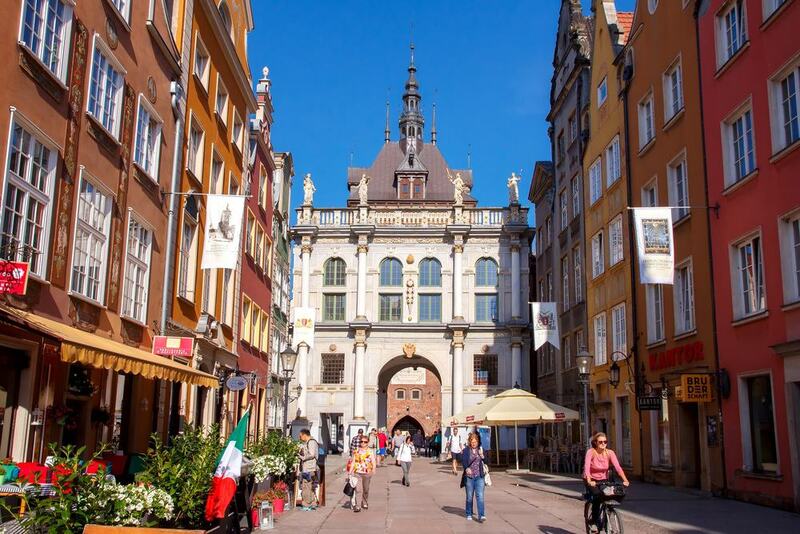 On Long Market, a few steps from the Artus Court is an enduring symbol for Gdańsk. Neptune’s Fountain is a Mannerist monument cast in bronze in the city in 1615, but wouldn’t be installed for another 18 years. The sculptor was Abraham van den Blocke, originally from what is now Kaliningrad, but with Flemish parents. 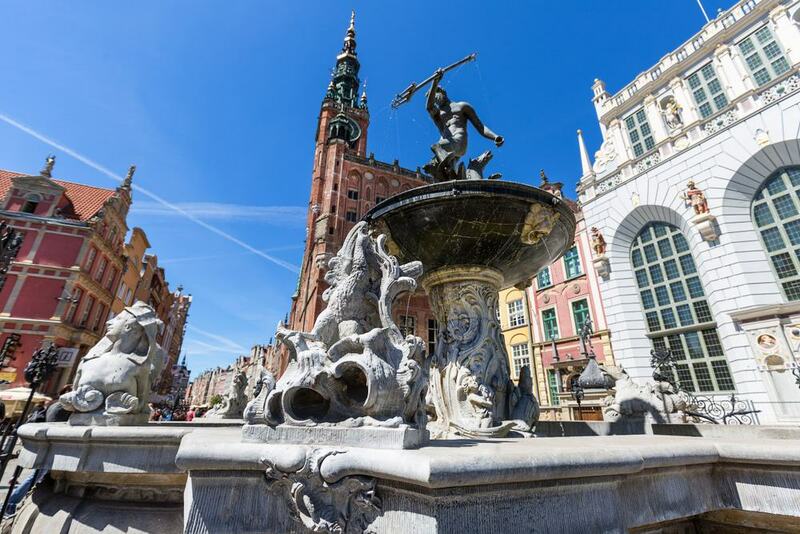 Located by the palatial townhouses where Poland’s royalty would stay in Gdańsk, the fountain’s sculpture shows Neptune bowing his head slightly as a sign of deference. On the basin beneath him are ornamental fish and cherubs. And if you’re wondering, the fig leaf on his private parts wasn’t in the original design, but was added in a restoration in 1988. Staying on the Long Market, two doors to the right of the Artus Court is a building often lauded as the most beautiful in the city. It’s not easy to disagree when you glimpse the white and gold facade. 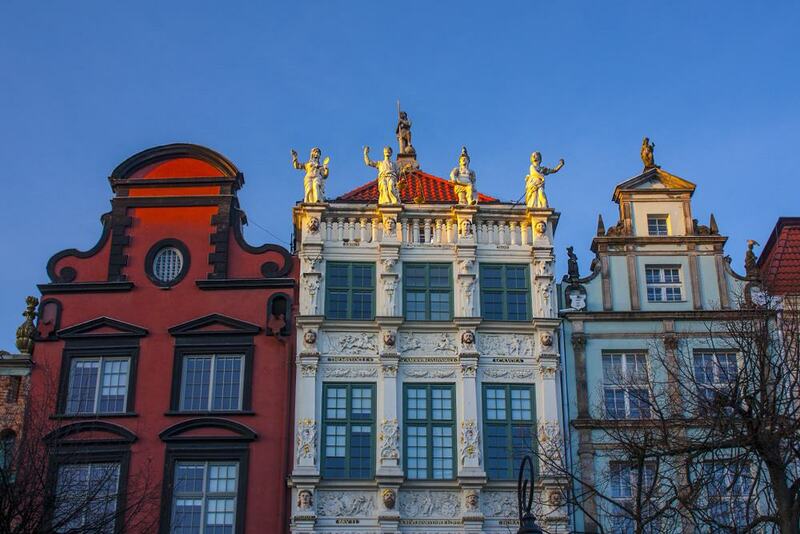 With Mannerist architecture, the Golden House was made for Jan Speyman, mayor of Gdańsk at the start of the 17th century. Designed by Abraham van den Blocke once more, the house has Gdańsk’s signature narrowness and height. But where it stands out is for its sculpted friezes, 16 busts on its pilasters representing the Polish kings and the statues atop its balustrade for Achilles, Antigone, Cleopatra and Oedipus. The Main Town Hall was drawn up by a team of Dutch architects in the middle of the 16th century. You’ll have to crane your head back to see him, but there’s a life-sized gilded statue of Sigismund II Augustus, the king of the period, on the pinnacle 83 metres above street level. The interior is also managed by the Historical Museum and has sumptuous state rooms in the Dutch Mannerist style. The Small Council Hall, Great Council Chamber, White Hall and Winter Hall have gilded stucco, coffered ceilings, marble floors, frescoes, sculptures and tapestries . You can head to the observation gallery for a vertical view of the city and hear the 37-bell carillon chime on the hour. Beginning at St Mary’s Church and continuing east towards the Motlawa River and St Mary’s Gate, Ulica Mariacka is a delightful cobblestone street edged by narrow merchants’ houses with regal portals. 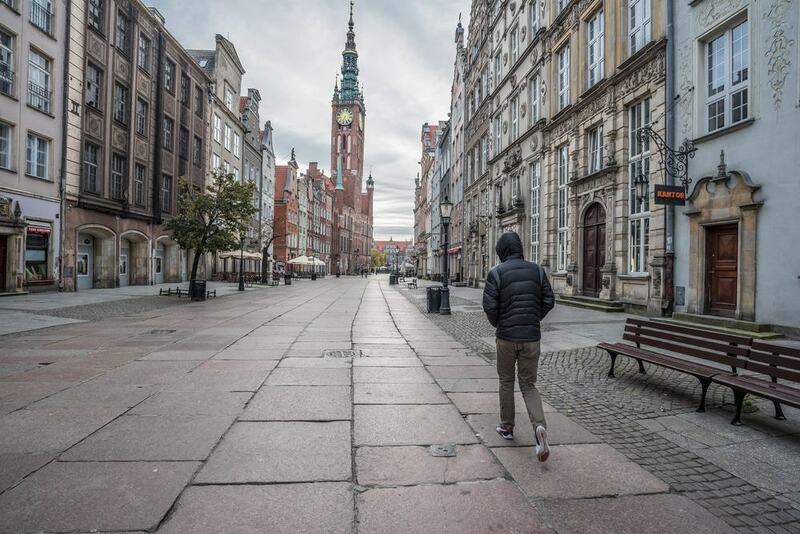 You can understand why this street is often used as a shooting location for period movies, and like a lot of Gdańsk it had to be pieced back together after taking extensive damage in the Second World War. All of the entrances to these houses are on little terraces a few steps up from the street itself, and the restaurants that line the way have tables in these cute spaces, often with ornamental reliefs on their low walls. An emblem for the city, the Gdańsk Crane on Motlawa’s Long Embankment dates back to the 14th century. This piece of machinery harks back to the time when Gdańsk was in the Hanseatic League, and could load or unload four tons of cargo, lifting it to a height of 11 metres. The power came from humans, as groups of men would walk inside two large wooden wheels as if they were hamsters. The crane doubled as a waterside city gate and was in use up to the 1800s. Now maintained by the National Maritime Museum, you can go in to see the wheels and an exhibition about work and daily life in the port from the 1500s to the 1700s. Before the port was relocated to the mouth of the Dead Vistula River in the 19th century, this quay was where all of Gdańsk’s loading and unloading took place. In those times defence was vital, and so there’s a “water gate” defending the entry to each of the streets running perpendicular to the river here. These seven gates, the old warehouses on the opposite bank, and the characteristic narrow gabled houses overlooking the water, conjure old-time maritime magic. But while the scene is now rather quaint, the docks here had a nasty reputation in the old days when thugs would prowl the quayside. This popular tourist route has lots of outdoor seating if you’d like a meal by the water. This landmark museum was inaugurated in March 2017 and stands on a quarter that had been flattened in the war. 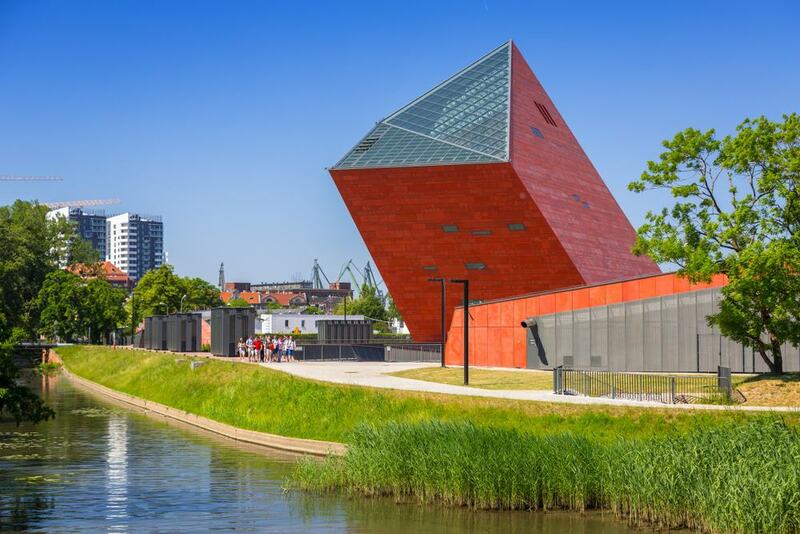 It makes sense that Gdańsk should have a museum of this calibre about the conflict because the Invasion of Poland began in earnest in the Free City of Danzig on 1 September. Many of the museum’s 2,000 exhibits were donated by families that were caught up in the conflict, putting a human face on the devastation. The exhibitions are designed in an unorthodox way and so are difficult to describe in a paragraph, but there are many immersive walk-through installations. One that will stay with you is a Warsaw apartment, with rooms from before, during and after the war. There are also two tanks, a Sherman M4 Firefly and a Soviet T34, placed in war-damaged street scenes that had to be built around them. Afterwards you can make the brief trip to the peninsula that curves around the final bend of the Dead Vistula. Here you’ll set foot on ground zero for the Second World War. A Polish military transit depot was installed here in the 1920s by permission from the League of Nations, and was seen by the Germans as a vital first domino for their invasion. With dwindling supplies and no effective way of responding to the attack, the depot withstood bombardment from the sea and for seven days before surrendering on 7 September. After the war one of the guardhouses was restored and turned into a museum, while the others have been left in ruins. 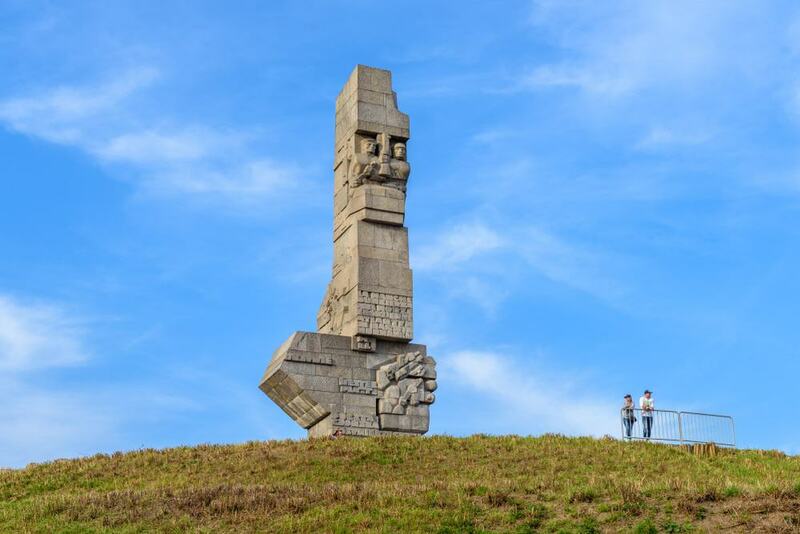 At the highest point of Westerplatte there’s also a memorial to the “Coast Defenders”, erected in 1966 and made of 236 granite blocks rising to 25 metres. At the western end of Long Street, this beautiful Mannerist gate is in a string of fortifications in front of the fearsome Prison Tower and High Gate. The Golden Gate is from the 1610s and was raised to replace a Gothic gate that had come before. Abraham van den Blocke, the man behind Neptune’s Fountain and the Golden House came up with the design for this structure. The gate has a balustrade on its roof and on both sides are four allegorical statues representing the qualities of an ideal citizen based on the classical cardinal virtues: Peace, Freedom, Wealth and Fame on the west side, and Harmony, Justice, Piety and Prudence facing Long Street. These figures are at the top of four Ionic columns with golden capitals. 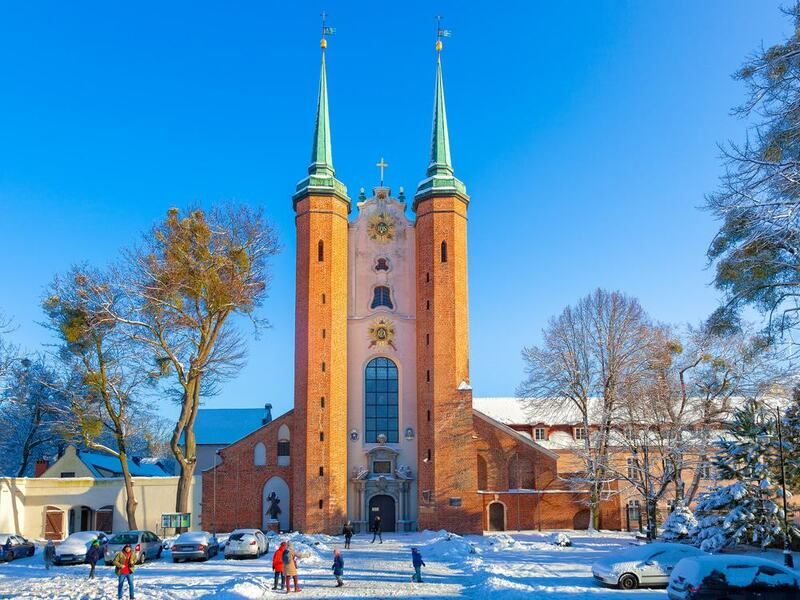 As you see it now, this church in the Oliwa District, some 10 kilometres northwest of the Old Town , dates to the 14th and 15th centuries. A fire gutted the interior in 1577 during the city’s rebellion, so nearly all the ornamentation is Renaissance, Mannerist and Baroque. There’s a solemn Baroque portal from 1688 at the entrance, below two narrow towers, each 46 metres tall. The nave, chancel and 23 altars are festooned with paintings by Gdańsk’s foremost artists in the 17th century. There are two main altars, one “Old” in the Late Dutch Renaissance style from 1605, and the other “New”, from 1688 and viewed as the finest piece of Baroque art in Pomerania. Solidarity was a trade union and civil resistance movement founded at the Lenin Shipyard in 1980 and led by future president Lech Wałęsa. To understand Solidarity’s context and progress you can come to the six exhibition rooms at the Solidarity Centre on its namesake square. The centre opened in 2007 and its rusted facade points to Solidarity’s industrial beginnings. There’s a lot of substance at the exhibition, which uses imaginative design to make sure you’re never overwhelmed by facts. You’ll get to know the key characters, find out about Solidarity’s core philosophy and the role of the church in the movement, and also how it quickly spread to other Soviet satellite states. That Prison Tower dwarfing the Golden Gate has a museum all about Gdańsk’s relationship with this gemstone. The amber deposits in the Baltic are the richest in the world, and amber helped fuel the city’s economy after a guild for this gemstone was formed in 1472. 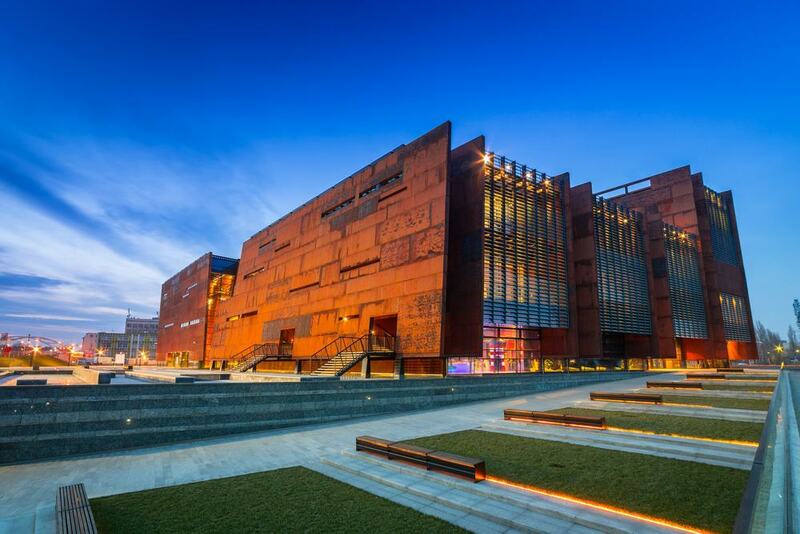 Poland’s first museum dedicated to amber documents this history, showing how it was extracted in Medieval times and how it was ascribed magical and even medicinal properties. 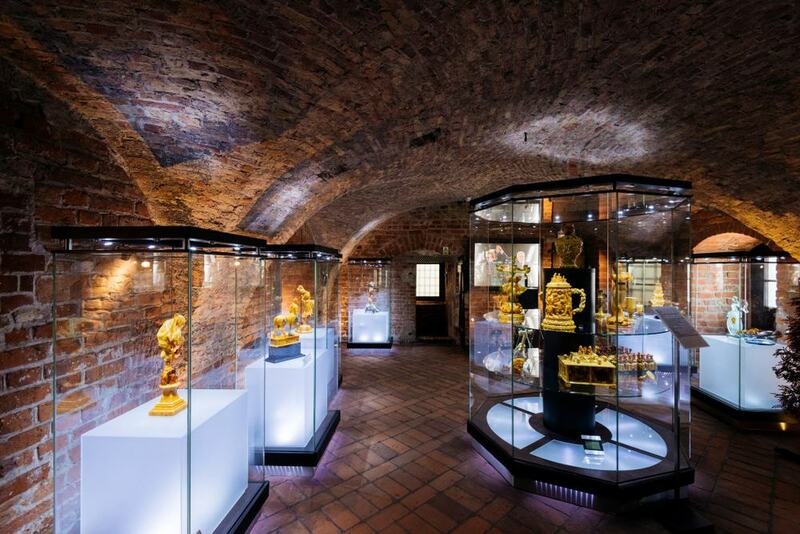 There’s a stunning collection of amber art from the 16th, 17th and 18th-centuries, as well as modern, artistic contemporary jewellery crafted in Gdańsk. Check out the Jurassic Park-style “inclusions”, where insects have been trapped in this fossilised tree resin for tens of millions of years. 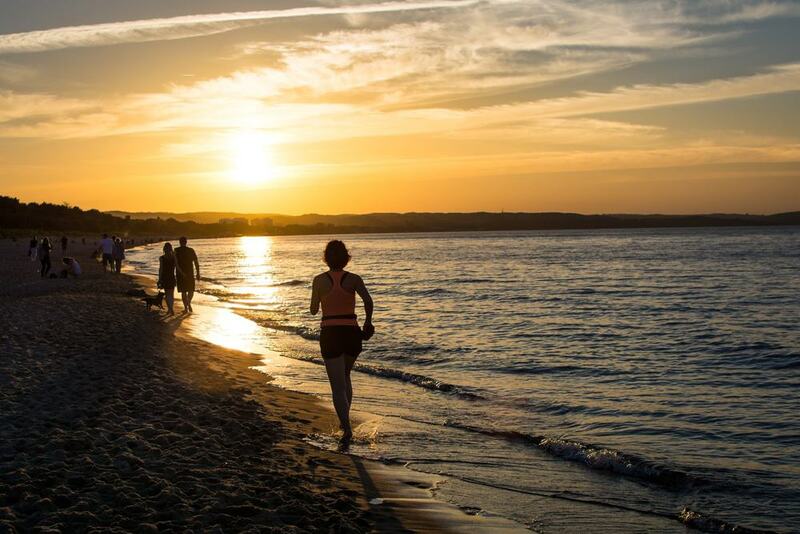 After a day or two on the streets of Gdańsk you may be ready to rest up on a beach on the Baltic for an afternoon. The closest is on the waterfront of the Jelitkowo District to the northwest of the Old Town. This beach has a clean ribbon of fine sand backed by a chain of parks and curving for several kilometres up the coast to the west. Behind the foreshore there’s a paved cycling path if you’d like to break even further from the city. But wherever you are you’ll never be more than a short walk from a beach bar in summer, and there are bouncy castles and trampolines to keep littler members of the clan entertained. You can get to Jelitkowo via trams 2, 6 or 8.